It’s that time of year again when people think that they should shave their double coated dog. They think that it is doing something nice for them. This couldn’t be further from the truth. The question still remains then, why not shave them and just keep them out of the sun? For one, they may not actually be cool even if they are out of the sun, the topcoat can help to keep the heat off the skin itself and unlike people dog’s do not sweat through their skin. Dogs sweat by panting and in all but northern breeds, through the pads of the feet. Shaving them actually removes some of their natural ability to stay cool. Another reason is that when the hair does begin to grow back it tends to do strange things. 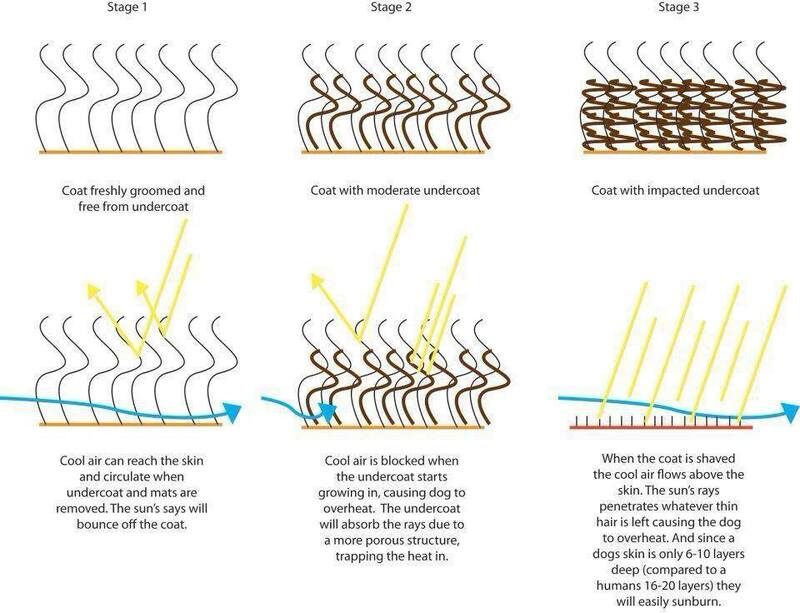 For some, it may mean having patches that don’t grow at all, or that don’t grow both types of coat layers (top and under), older dogs often have issues with proper regrowth and then for others (which happens most often) the undercoat grows in faster than the topcoat (since the topcoat isn’t meant to shed extensively it grows extremely slowly) so now that protective topcoat is matted into the undercoat. Dogs like this generally appear as though they have thyroid issues. The hair looks fuzzy and varies in length all over the body. This doesn’t mean the coat will forever stay this way. 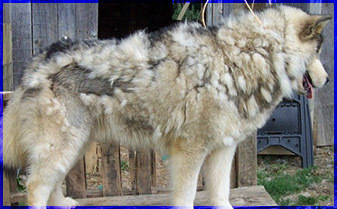 Most of the time with regular brushing and the next shed cycle the topcoat will get longer while the undercoat sheds away, eventually leaving the coat the way it once was with long topcoat guard hairs and a thick shorter undercoat. One other thing to note about those topcoat guard hairs – they actually prevent the dog from getting wet. Due to the coarseness of the guard hairs water rolls off of this topcoat keeping the undercoat dry, which in the winter is important to keeping the dog warm and dry. Is there an ideal brush to deal with double coats I have one dog that loves to be groomed and the hairiest one views it as a form of torture.